It's no secret that I love the French sense of style [the blog title is a dead giveaway] - so when Gemini Woman got in touch and asked me to put together a post celebrating the launch of Petit Bateau [aka the holy grail of the Breton stripe] on their site, I was more than happy to oblige. In a change from the classic Breton tee, I picked a navy stripe dress to style [£120 - shop here] because I wanted to demonstrate it's versatility. 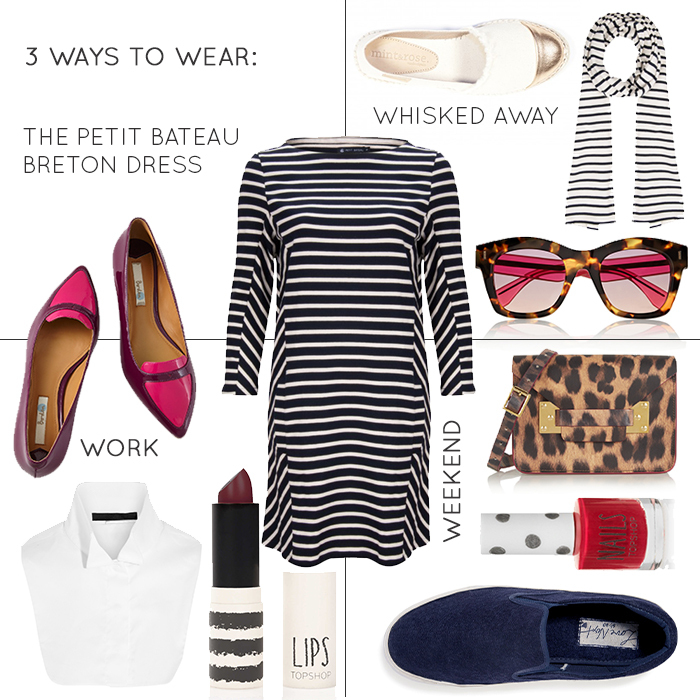 If you're yet to jet off on your summer escape, a Breton dress makes an ideal beach cover up. Style it espadrilles for a St. Tropez vibe. Stripes are also the perfect print for weekend wear - wear your dress with a pop of leopard print for an unexpected twist. You can even smarted up this piece for the office, I'd wear either a white shirt or bib collar under mine for a professional edge. Pair with some colourful flat points and you've got a 1960s homage going on which is a key trend for autumn/winter 2014. If you're unfamiliar with Gemini woman, I'd recommend checking out the site. They stock a curation of grown-up, wearable fashion brands including French Connection, Great Plains and of course - Petit Bateau! Whisked away: Amalfi espadrilles, Mint & Rose, €75. Petit Bateau stripe scarf, Gemini Woman, £47. Fendi two-tone sunglasses, Net-a-porter.com, £200. Weekend: Sophie Hulme mini leopard print shoulder bag, Net-a-porter.com, £395. Nails in One Hot Minute, Topshop, £5. Felt borg skater shoes, Next, £24. Work: Pointed pumps in beetroot, Boden, £89. Karl Lagerfeld folded cotton-blend collar, Net-a-porter.com, £110. Lips in Inhibition, Topshop, £8. I'm not one for spending big bucks on my holiday wardrobe. If it's at the mercy of suncream, seawater and sangria, it most likely won't see out the summer. So in this frugal spirit, I've put together this dirt-cheap edit of holiday buys, all under £30. I think I'm quite good at putting together a capsule holiday wardrobe - the key is to stick to one colour palette and travel with lots of pieces that can be mixed and matched. I always pack some costume jewels to dress up outfits for dinner - the Johnny Loves Rose tangerine drop earrings below are a nifty purchase. A few cheap, disposable tees are a good idea - I like Uniqlo for quality budget buys. The shoe of SS14, leather sliders are super comfy and practical for both the beach and sight seeing. And if you're as pale as pasty as I am, don't forget the suncream! Top row L-R: Linen blend tee, Uniqlo, £4.90. Nails in Pink Cadillac, Topshop, £5. New Look white leather sliders, ASOS, £19.99. Middle clockwise: Warehouse pink sunglasses, ASOS, £16. Palm tree print clutch, New Look, £9.99. Zip detail black bikini set, F&F, £13. Woven black shorts, H&M, £24.99. Bottom row L-R: Lace espadrilles, ASOS, £9. Johnny Loves Rosie Orange statement earrings, Myflashtrash, £12.